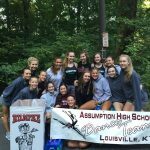 The dance team volunteered this weekend at the Colon Cancer Prevention Project 5K at Iroquis Park. The team manned the water station, cheered on the runner and walkers and kept them hydrated. Way to go Rockets!